To become an experienced shooter, you need to be able to adapt to your environment and take the important shot, whatever the situation. That’s why an accurate, reliable low-light scope is a fundamental part of any marksman’s collection, and it is something that can massively increase your accuracy, whether the light is dark or not. When it comes to picking the best low light scope that you can rely on, it’s incredibly easy to get drawn in by all of the sale drivel that advertisers throw in your face, which is why we created this handy guide, counting down the top-six scopes for low-light shooting. 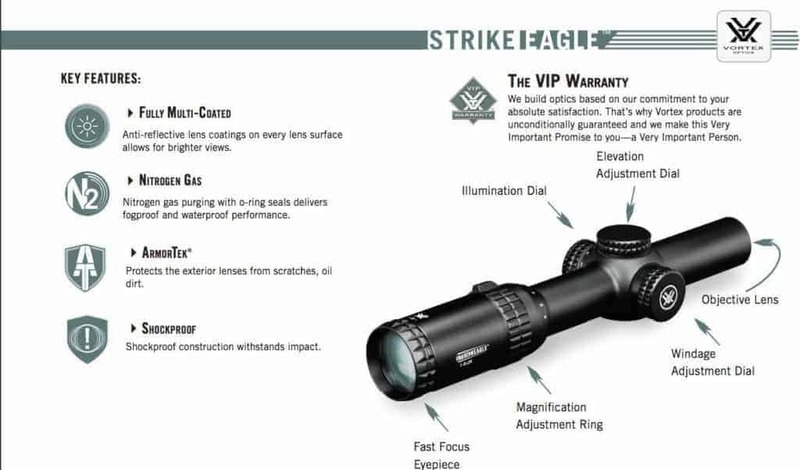 The Vortex Optics Strike Eagle Rifle Scope offers an illuminated reticle and a multi-coated lens making it one of the best low light scopes. The Vortex Optics Strike Eagle Rifle Scope is a versatile, functional riflescope perfect for shorter ranges up to 600 yards and provides a stellar performance in dim lighting due to its illuminated reticle and multi-coating. The scope provides great quality and performance straight from the box, and two batteries are included for convenience. The clear glass on this rifle scope is comparable to that of much higher end scopes, and the magnification ring is tight and smooth. Additionally, the magnification range on this scope ranges from 1x to 6x, and the objective lens is 24mm in diameter. With a smaller objective lens, it is easy to fit this scope on nearly any rifle comfortably, and the scope is lightweight making it very comfortable and convenient to use over a longer duration. 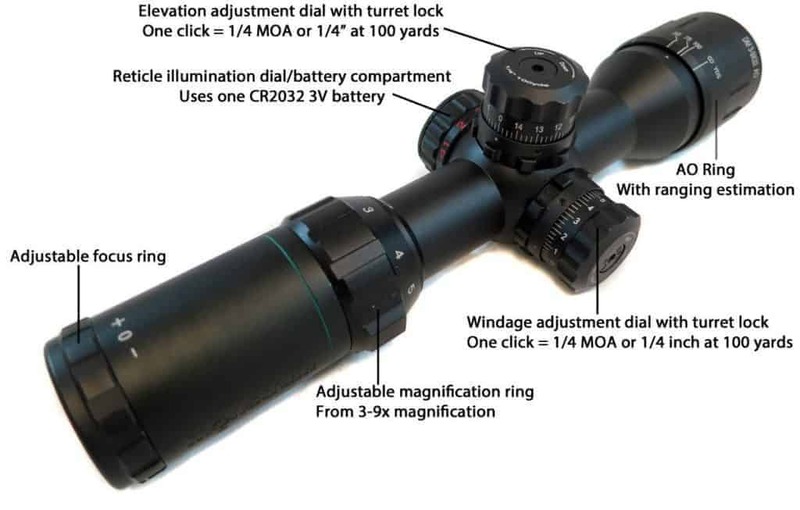 While the magnification range is not huge, this scope is a solid, consistent performer that is not likely to become damaged or worn down easily. Even more, the AR-BDC illuminated reticle is accurate and easy to use, especially at closer ranges. The cross-hair design is easier to use than the simple dot reticles. All in all, the Vortex Optics Strike Eagle Rifle Scope is truly one of the greatest rifle scopes for low light settings due to its accurate illuminated reticle and multi-coated lenses that provide a clear bright image in even the dimmest of scenarios. Features that make this a fantastic scope include a multi-coating designed specifically for dusk and dawn lighting and a 40mm objective lens for absorbing more light. The Bushnell Banner Dusk & Dawn Multi-X Reticle Adjustable Objective Riflescope provides a consistent accuracy from short ranges even during the dimmest times of day. This powerful performance in dim lighting can be attributed to the multi-coated lenses flawlessly designed for high performance during dawn and dusk. Another feature that may attribute to the strong low light performance is the 40mm objective lens that is large enough to transmit a good amount of light for a brighter overall image. Because this scope is designed for shorter range uses, the magnification range starts at 4x and reaches 12x, which is not bad at all. Another reason we love this rifle scope is for its durability. The one-piece construction creates a tight weatherproof seal that can resist fog, shock, moisture, and anything else you are willing to throw at it. The only downside we could find with this scope is the lack of an illuminated reticle, but for the price, you can’t complain much. For one of the best low light scopes in its price range, you won’t find anything better than the Bushnell Banner Dusk & Dawn Multi-X Reticle Adjustable Objective Riflescope. The useful multi-coated lens is something you won’t likely find on any other scopes within the competing price range. Once again we have a cheaper rifle scope option, but this time with an illuminated reticle. The fact that this scope is priced so low and still can offer an illuminated reticle shows that this scope was designed to be the best of the best. The Tasco World Class Illuminated Reticle Riflescope is a minimalistic rifle scope that has all the great features you need. You could always spend hundreds of dollars on a rifle scope with the latest and greatest features on the market, but when it comes down to the simplistic task the rifle scope was created for, these features are not always worth spending the extra cash. The illumination dial, which makes this one of the best low light scopes available, has 11 settings of color intensity. 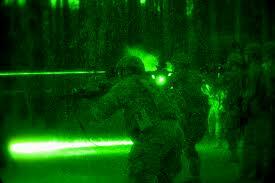 Even after years of use the lithium battery that powers the illuminated reticle won’t die on you. Obviously, the exact time will vary based on usage and power settings. 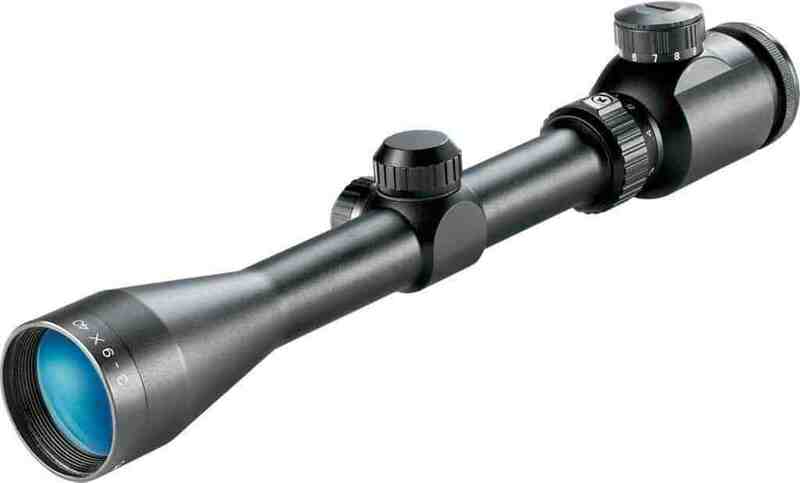 This scope also features multi-coated lenses, which is another feature that makes it perfect for dim light scenarios. This coating provides a higher contrast image making it easier to see in low light. For the price, the Tasco World Class Illuminated Reticle Riflescope offers a lot of great features to establish itself as one of the better scopes out there. Seeing an illuminated reticle on such a cheap rifle scope is truly surprising. Due to the low price point of this rifle scope, we would not have long-lasting expectations when it comes down to the durability. If you are looking for a long-term scope, you may want to look elsewhere. The NightForce NXS Riflescope is a high-end rifle scope designed for low light, hence the name NightForce, making it one of the better scopes. The NightForce NXS Riflescope is a rifle scope specifically designed for use in dimmer lighting settings which is why they named it the NightForce. The larger 56mm objective lens is what makes this a good scope for dim lighting because the larger the objective lens, the lighter it can transmit creating an overall brighter and clearer image. Additionally, the MOAR reticle provides the user with a great amount of accuracy that is easy to use. This reticle, however, is not illuminated which is a feature we would very much expect to see from a higher end rifle scope designed for low light usage. Despite this downside, it is still one of the best scopes available on the market. 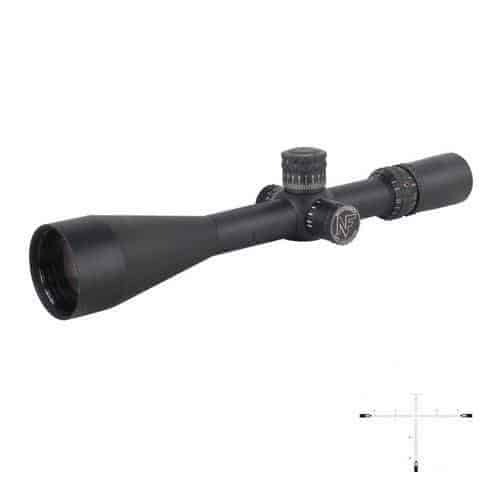 Other notable features of this scope include a durable magnification range from 5.5x to 22x for shooting from nearly any reasonable distance, ¼ accurate MOA adjustments, and a durable, weatherproof one-piece tube construction. For a higher end rifle scope, the NightForce NXS Riflescope has a lot of features to offer, but it fails to provide an illuminated reticle. Aside from this fact, this scope is flawless, but without an illuminated reticle, this scope struggles to keep up with the rest. We don’t want to fool you into thinking that this is a necessary feature for low light scopes, but most people find it useful. Overall, this is a near flawless scope that is durable, simple, and easy to use in dim lighting. The Monstrum Tactical AO Rifle Scope is a powerful budget option featuring a versatile illuminated reticle for accurate shooting in dim light making it ideal for shooting in dim conditions. This rifle scope has truly amazed us because nothing can beat the features included with this 300+ yards capable scope within the price range. The optics are not as crystal clear as some higher end models, but those can cost over 5 times as much money. The optics on this scope should surely be adequate for anyone who isn’t a Navy Seal. Additionally, the illuminated reticle is extremely useful, and the reticle system used allows you to estimate the bullet drop from up to 500 yards. Once you add in the adjustable AO objective lens, no parallax, and a 3-inch eye relief, you are getting a whole lot of scope for your money. Anyone who is looking for a rifle scope that will work flawlessly for practical uses should take the Monstrum Tactical AO Rifle Scope into consideration as it is one of the best on our list. 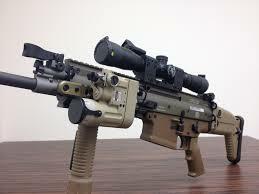 In conclusion, the Monstrum Tactical AO Rifle Scope is more than adequate for almost any use. 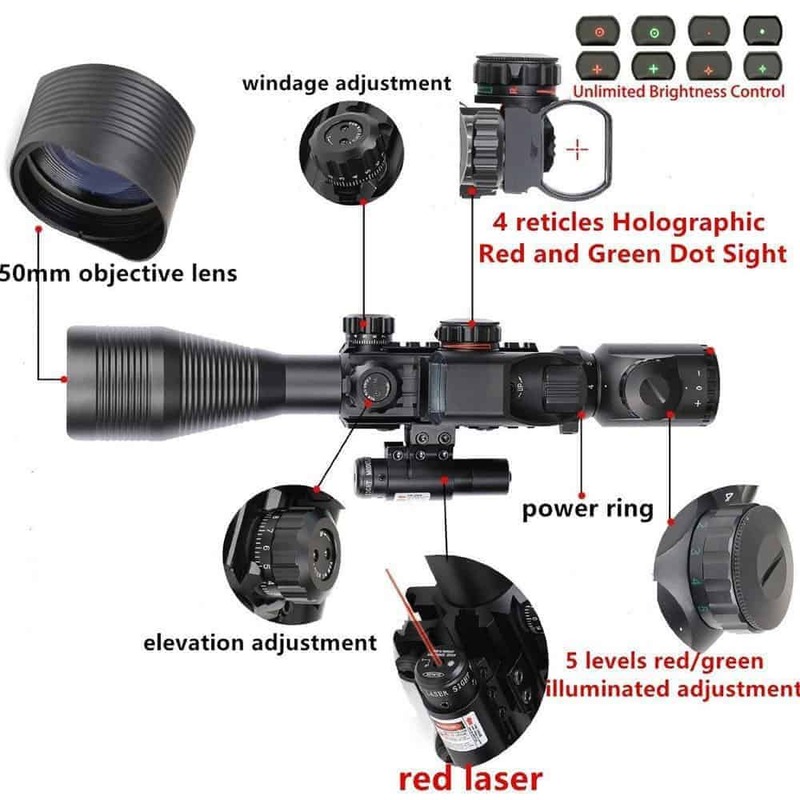 If you are someone who needs to have bragging rights, then you should go with a more expensive scope but anyone who is content with a solid performing riflescope will love this product, and that is why it is loved by many professional and amateur hunters. The Klau Dual Illuminated Rifle Scope utilizes a red dot sight along with an illuminated reticle to provide the user with one of the best low light scopes available. This is one of our best budget options. For such a cheap rifle scope, this product has a lot of power to offer. There is, however, one downfall and that is the short eye relief. Due to the scope having a shorter eye relief, we would only recommend using it with low-recoil rifles. 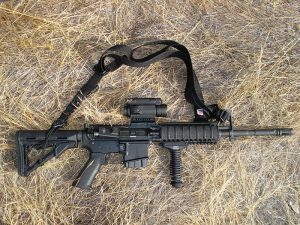 This scope has a fairly unique mounting system where you firs attach the scope to the rail mount, and then you attach the rail mount to the rifle rail. With the rifle scope, you also get two of these mounting rails so that you can use the one that best fits your rifle. The primary reason we named this one of the best, is the illuminated reticle that can be adjusted to various brightness settings with a red or green color. To zero the reticle, there are 2 accurate and easy to use adjustment knobs. In addition to an illuminated reticle, there is also a laser dot sight equipped on this rifle which we have found to be surprisingly accurate. There is even a knob that you can use to adjust the laser dot sight! Overall, the Klau Dual Illuminated Rifle Scope is a very powerful and versatile performer at a very low cost, and it is one of the greatest performing scopes in dim lighting scenarios due to its accurate laser dot sight and illuminated reticle. For anyone looking for a low light scope on a budget, this is it. thehighroad.org : Best low light scopes? thefiringline.com : What is the best low light scope under $1000? 24hourcampfire.com : Best scope for low light hunting ?